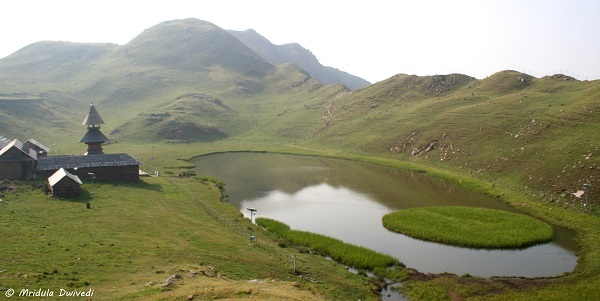 When we reached the forest guesthouse at the Prashar Lake after climbing for 4.5 hours (it took me 4.5 hours, you may take more or less) from Bagi (the starting point of the trek) food was the dominant thought. The trek route and the jeep route are different. 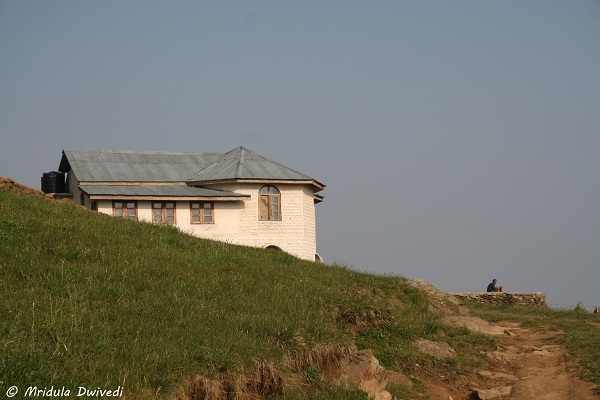 At Bagi there are a few Dhabas but there is nothing on the way. So, if you like to munch in between 4.5 hours of climbing up and up and up, one has to carry stuff from below. The Dhaba gives good bun -omelette but little else. We carried chocolates and stuff from Mandi. Once we reached the guesthouse and finally given a room food was the next logical question. The Chowkidaji (caretaker) who cooks the food does so on wood and buys ration only when someone is there, so nothing was immediately available. 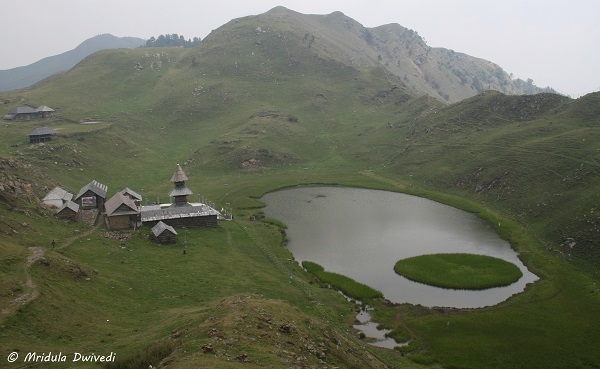 The lake that is 1.5 (approx) kilometres away from the guesthouse and it has an ancient temple devoted to Prashar Rishi. It has two canteens or so we were told. We headed there next for a late lunch. One canteen is near the entrance and other close to the temple. At the canteen near the gate the only food available was Dal (curry) and rice with no vegetables or anything. But we were so hungry that the food tasted like one the best meals we ever had. The dinner was promised at the guesthouse and as cooking on wood is difficult again you get either Dal and rice or Chapati and vegetables. We asked for Maggi (noodles) at the canteen the next day and they were not available. It was a little disappointing. For us eating Maggi after a trek is almost a ritual. However, the day after there were mules and jeeps as the canteen near the gate was replenishing stocks and we finally got Maggi! Both the canteens make equally good tea but the one near the gate has the location advantage. We did not feel like walking down (and later climbing up) to the canteen behind the temple. We took all the major meals at the guesthouse. There was no breakfast available at the guesthouse on any of the days. The guesthouse room rent charges this season were Rupees 200 per day. When we were finally settling our account on the last day, our room rent was Rs. 400 and when we were asked about the food charges to the gentleman who cooked food for us, his reply just stunned me. He said, (in Hindi and I am translating loosely) “Room rent is the government charge but give us whatever you wish for food, we are not going to quote any price!” Both my husband and I were floored by this completely unexpected reply. We gave what we thought was fair money and he seemed to be happy for it. But I mean in this day and age who says stuff like the above anymore?